In a Monday Cuba state media article, Castro accused Washington and EU allies of warmongering. He compared NATO to Hitler’s SS. More on what he said below. At age 88, Castro is outspoken on geopolitical issues mattering most. His intellect remains keen. His honesty and integrity are impeccable. His forthrightness is noteworthy. His knowledge of vital issues is impressive. He survived hundreds of US attempts to kill him, a punishing embargo and countless other hostile acts. In 2006, illness forced him to step down. Reports at the time erroneously pronounced him dead or dying. He recovered and remains active. Hopefully he has many more productive years left. “Fidel is a giant,” said Maduro. He’s a role model for right over wrong. He’s a legend in his own time. He’s polar opposite rogue Western leaders. US-led NATO is a global killing machine. It threatens humanity’s survival. It prioritizes war. It deplores peace. It ravages and destroys one country after another. Humanity’s survival depends on eliminating this cancer once and for all. The alternative is too grim to tolerate. 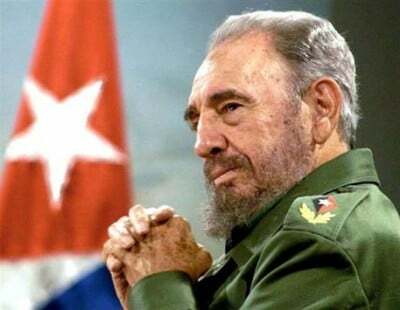 Castro accused Western politicians of hypocrisy and aggression. The West is “a symbol of imperialist policy,” he said. Instead of waging war, “governments should produce food and industrial products, build hospitals and schools for the billions of human beings who desperately need them; promote art and culture, struggle against epidemics which (kill) half of the sick (and) finally eliminate…cancer” and many other life-threatening diseases. He accused Senator John McCain of supporting Israel’s Mossad. Washington and Israel created the Islamic State, he said. At stake is humanity’s survival, Castro explained. It’s being “led inexorably toward disaster,” he believes. He hasn’t “the slightest doubt,” he said. “A nuclear war is inevitable,” he added. It could happen any time for any reason. On July 18, his article titled “Astonishing Provocation” blamed Kiev for downing MH17. At the same time, he denounced Israel’s Operation Protective Edge. He called it “a heinous crime.” Washington fully backed it. “Obama did not support David against Goliath, but Goliath against David,” he said. “I only wish to express my solidarity with this heroic people defending the last inch of what was their homeland for thousands of years,” he added. Given Washington’s imperial agenda, he very much fears the latter.